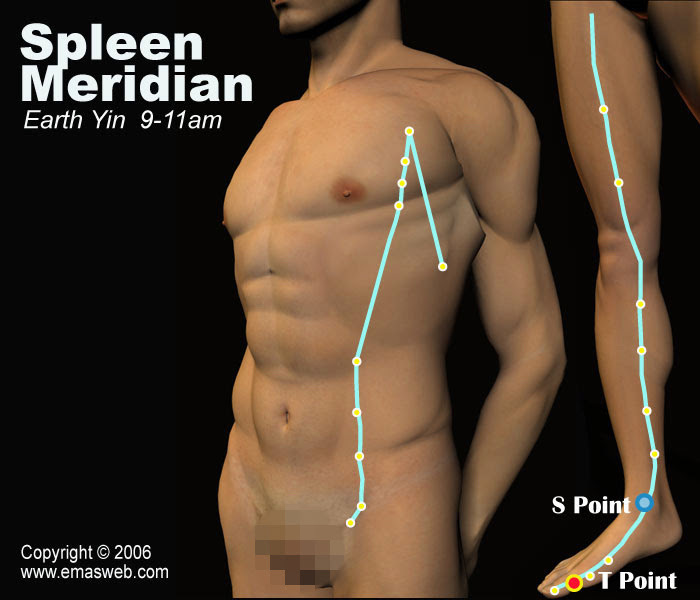 The Spleen Meridian connects with the Stomach Meridian, with which it is externally-internally related. The Spleen Meridian refers not only to the Spleen itself, but also the pancreas, salivary glands, muscular system, etc. Based on traditional Chinese medical theory, the Spleen governs transportation and transformation. The function of the Spleen in transporting and transforming essential substances refers to the digestion, absorption, and transmission of nutrients. Abnormalities of the Spleen Meridian will result in borborygmus, diarrhea, stomachache, distention of the abdomen, and weakness. In addition, pain and stiffness in root of the tongue, and swelling and distention of the inner aspect of the lower limbs all show malfunction of Spleen Meridian. Peak qi and blood flow in the Spleen Meridian is from 9:00 am to 11:00 am. 1.Diseases of the digestive system (Stomach and Spleen). 2.Diseases of the uro-genital system. 3.Diseases along the course of the Spleen Meridian.